The Veronica Neunie line continues to grow and be a blessing to our family! 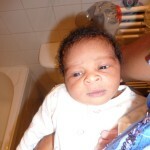 We have the pleasure of announcing the arrival of Tahan Selase Dayes; Descendant Order; (Adesah Neunie, Anthony Neunie, Veronica Neunie, Nee Hibbert, Huntley Hibbert, Solomon Hibbert, Robert Hibbert) born 23, Sept 2011. Tahan is a Hebrew name meaning ‘merciful’, Selase (Selassie) is an Ethiopian word meaning Trinity. Tahan is welcomed by his loving family in England including his big sister, Sanaa (6). Please welcome home our newest family member with love and blessings. We have the pleasure of announcing the arrival of Marissa Elizabeth Ayele Robertson; Descendant Order; (Tamika Robinson Nee McGowan, Paula McGowan, Nee Hibbert, Edward Hibbert, Huntley Hibbert, Solomon Hibbert, Robert Hibbert) born March 24, 2011. Marissa parents, Maurice and Tamika are ecstatic about their beautiful First Born Daughter. 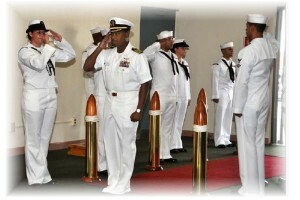 Kirk “Ricky” Hibbert, Great Grandson of Solomon and Elizabeth takes command of Naval base Guantanamo Bay, Cuba. Leave him a message of encouragement and support. By now many of us have received the heartbreaking news that our beloved family member, Deane Hibbert was struck with a life threatening stroke while in Australia. On Thursday, Deane made it through a surgery to relieve pressure on his brain but remained in critical condition. The first days after the operation were pretty critical but doctors were encouraged by Deane’s ability to respond and squeeze his wife’s hand. His children (Asha, Kim & Daniel) and his brother (Daron) have all made the trip and have joined his wife Debbie by his side. Please send your love and prayers to Deane and his beautiful family during their time of need. For updates on Deane’s condition and to make donations to the family please see the Bulletin Board. The reunion has just ended and we would love to know your thoughts. Many of you were new to our family reunions and all of us got to meet new family members. The Olympics was a great success as was the Memorial Service and the Banquet; but the highlight of the week was the “Hibbert Idol.” We are interested in knowing what you thought about the reunion. Please leave your comments here. Please tell us what you think about the new website!